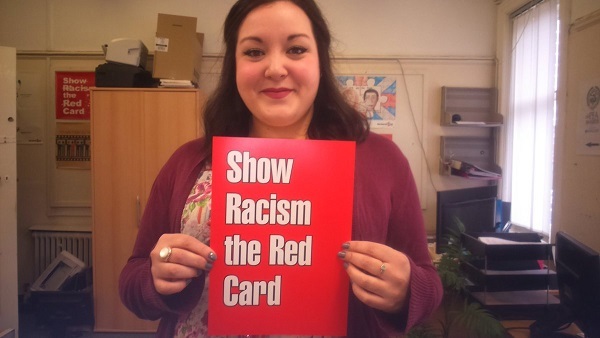 What has my first month working for Show Racism the Red Card as an Education Worker been like? ...Where on Earth do you begin to tell a story that has changed your life? Yes, it’s understandable that one might suggest this is a rather dramatic statement to start with, how much can really happen in 4 weeks? But the truth is the last month has changed not only my understanding of the subject of racism, my appreciation for the imperative and amazing work that is done by the charity but also my outlook, opinions and feelings about myself and this ever-changing world that we live in. It seems only right to start at the beginning. While working as a Primary Teacher I was told on numerous occasions that I should be proud of the work I was doing and celebrating the contributions and influences I was having on the children I worked with. Yes, I should feel proud and on some days I did. Yes, I should celebrate the contributions and influence I was able to have on the children...and some days I did, but it always felt that something was missing. So often what felt like a million concrete boulders got in the way of this sense of pride and accomplishment and I began to lose sight of these positive things; feeling like I was in an everlasting battle with myself and the powers that be. A battle where on one hand I was doing everything I could to make it possible for the children to achieve the expected academic levels and test scores that were deemed appropriate by someone who had never met these children and had no real concept of the challenges they faced every single day and on the other hand trying to support them in finding out who they were, what and how they felt about things and finding some time and space to allow them to indentify a place for themselves within this mad world. The latter was the real reason I went into teaching and unfortunately I was never able to really feel like I’d made the difference I hoped to in my more optimistic early days of teacher training. That being said, however challenging this is and was for me, it is not an impossible task and I have many close friends who are teaching and are a real inspiration to me because they somehow manage to achieve this every single day, often at the expense of their own lives, health and on occasions sanity. I knew I loved to work with young people and I didn’t want to move away from that but I also watched as the demands on young people became ever more challenging and I felt utterly helpless watching this happen. With the developments and ever-growing popularity of the internet, social media and often unrealistic expectations placed on young people’s natural ability and knowledge of how to use them it would be fair to wonder if the very things that were created to assist our society in becoming more informed, gaining a greater understanding of the world and allowing us to connect to any other human in any other part of the world aren’t actually the very tools being used to create a misunderstanding of the world, a detachment from our fellow man and a platform for celebrating our own ignorance. It has become easier to keep up to date with the life and events of someone you have never met who has access to social media, than a close friend or family member who has no interest in using a social networking site. This makes me uncomfortable, but I can’t deny that I am as guilty as the next person for occasions where I’m glued to my phone while trying to carry on a conversation with the person sat a few feet away from me. I know firsthand that I don’t really have any real idea what we talked about and that person was unlikely to consider themselves truly listened to. I too have not been a particularly wonderful example to young people at times. So I started to look into what I could do instead. I wanted to teach, I come from a family of teachers; it’s in my blood. But I wanted to teach young people to learn about themselves, why they do what they do, feel what they feel and think what they think? And challenge them to truly understand the affect they have on both their community and within society. No easy task! It was in sharing this desire with friends and family that I was pointed in the direction of a job advertisement for the role of Education Worker with Show Racism the Red Card. I had heard of the work that was being done by the charity and knew it had been my hope for a long time to be working for a charity doing something that really mattered. After thinking it was highly unlikely that I would ever be a suitable candidate I almost didn’t bother looking at the job description but on a lunch break in an empty staffroom I thought I’d take a look and see what I would be missing. As I read through the document I knew this was my job. The opportunity to work with young people, a chance to deal with issues of equality; something I have felt strongly about for as long as I can remember and my opportunity to make that difference I never felt I was quite achieving. Being of a more modest disposition and on occasions simply lacking in confidence I had no real expectations of even being invited for an interview, but alas I completed my application and was invited along to interview and asked to give a short presentation. I decided to use what I know and tap into my teaching skills to show how I would create a new workshop for primary aged children based on racism...not an easy thing to explain in 5 minutes! And already I fell at the first hurdle and nervously chattered on aware that time was ticking away and I would never be able to stick to my allotted 5 minutes but so eager to discuss all the new ideas that were flooding into my head at that moment; where had they been before when I could have calmly ordered them and practiced my wording in front of the mirror, getting my timing down to a near perfect 5 minutes (give or take a few seconds). Even so I was invited to interview and the rest is history. I got the job! Unbelievable! I bounced home calling as many people as possible and feeling so proud to tell anyone who would listen that I would be working for Show Racism the Red Card. Very quickly I found that I was suddenly feeling like a small fish in an eternal pond. It would seem you can never know enough about racism and I felt like I had barely scratched the surface. Having always considered myself someone who was relatively up to date and knowledgeable about prejudice and racism I was suddenly part of a world where politics and inequality were being discussed and challenged every minute, it is at the core of everyone here. This is an overwhelmingly informative and inspirational environment where you can feel a buzzing electricity in the air, full of information and questions but what struck me more than anything is that these people care unconditionally about people. I felt immediately at home and within a matter of hours of being in the office I was sharing experiences, knowledge and opinions and in turn being listened to, valued and accepted. It wasn’t until I started reading my large pile of books, annual reports and teacher packs that I truly understood the necessity of supporting the personal journey of each person as they delve deeper and develop a more informed understanding of just how bad the problem of inequality and acceptance in the world actually is. It was also alarming to suddenly find I was questioning everything I thought I knew about myself. Suddenly I was no longer sure of my identity, at what point does my mother’s mixed heritage become too ‘diluted’ for me to call myself mixed heritage too? There is no colour chart to help you identify as a particular description, and even if there was I know my family wouldn’t adhere to it anyway. What does culture have to do with racism? Do I even know how to define culture? And how have I been so unaware of the prejudice towards Gypsy and Traveller communities? Have I ever even met a Traveller? How would I know? The realisation that you really don’t know much about something you thought you knew quite a bit about is a terrifying moment, but strangely enough I also felt liberated. After a period of guilt that I hadn’t gone off and found these things out already I came to the conclusion that I may not have ever had a reason to go and research them. There are things I don’t know but I never knew that I didn’t know them...so why would I question it? Suddenly it clicked that I was going through the same journey as I was going to be taking the young people on. All these questions have been consuming my mind and I am lucky enough to have the support, the means and the opportunity to research, ask questions and trust my sources, but do they? Talk about a lightning bolt moment. I immediately felt myself let go of the embarrassment that I didn’t know how to describe the skin colour of certain people in the world; the fear that others might find out how unsure I was of significant dates in history; and the overwhelming feeling that I would never be able to deliver a 2 hour workshop with so much information in it and still make it interesting, interactive and even fun for young people. All of this was gone (or at least significantly reduced) and I was ready to start my journey; to learn, experience, question and debate and never look back. To say that my views have changed would not necessarily be accurate, instead they have expanded, exploded and been completely regenerated – I am now able to use my previous knowledge and add to it what I have accumulated so far, making links and asking more questions as I learn, but my core values have not changed. I still feel strongly about the issues I felt strongly about before but now I am in a far more powerful position, I have the beginnings of a vast and varied knowledge and with that the growing confidence that I can trust my instincts in being challenged and passing on information. I also have clear and very high expectations of myself and the workshops I deliver based on the level of work I have observed in my fellow Education Workers and Campaign team. After a couple of weeks of observing a number of workshops I couldn’t deny that I was itching to start delivering and leading the discussions the young people were having around our material and activities. I was used to standing in front of a class and not worried about the facilitator role but seeing some of the difficult and challenging questions that were asked within the sessions and being so shocked by some of the anger and misinformation that was regularly displayed by often very young people I was a little lacking in confidence. I questioned whether I really had enough knowledge to accurately answer queries or challenge the assumptions and views of the young people. But I had a go and very quickly realised that I had essentially been a sponge during the weeks of reading and in depth conversation with my colleagues and I was sharing information I hadn’t even realised I had stored away. The thrill of empowering young people and giving them the inclination and desire to start asking questions and considering their own world view has been exactly what I was missing; the piece of the puzzle I just couldn’t seem to find. As I deliver more and more workshops I am building in confidence and knowledge and my eyes are opened wider and wider to the barriers that have been put in place to try and stop, discourage or distract young people from considering why they think a certain way and who is pulling the strings ensuring they see certain misleading and often dangerous information. However, when during workshops they have been asked if the newspapers are always telling us the truth it has been refreshing to see that these young people are not always taken in by the lies and manipulation that they are faced with each day. But we take it a step further. During the SRTRC workshops we challenge the young people to consider how this information has formed and played a part in their thoughts and actions on a daily basis, even if they are confident that they aren’t taken in by it. It is fascinating to observe as they suddenly discover that they have had such little control over the opinions and views that have been formed in their minds and the question of why they fear certain people, dislike others and look down on some starts to be answered. With this can often come feelings of guilt, frustration and an overwhelming sense of what I have started to refer to as ‘mind blowingness’. Just as I was supported in my journey it is so important that the young people we work with feel supported as they start to question their identity with a deeper understanding, and that is what they do. I can’t help but think at the end of every workshop how amazing it would be if the parents and carers, brothers and sisters, neighbours and friends of those young people had only been able to access this information, be asked those same questions and start their very own journey alongside so that we can start to see a greater change in tolerance and acceptance within our country. We are all aware of living in particularly turbulent times politically and socially and it is certainly fair to say that the sense of hostility and fear has increased with the campaigning and results of the EU referendum, nobody seems to know what we are facing but it is clear within our conversations with young people that a lot of mixed messages are being passed on and people are feeling angry without even knowing why. It is no surprise. I feel angry. Frustrated. And lately often ready for a fight but I have learned over the years that the hardest but most worthwhile and powerful tool we have is unity. We cannot fight anything alone. We cannot accept the challenge and start afresh if we do not unite and we cannot expect change to occur if we don’t unite with our young people and ask them to help us in creating that change. My conclusion both to this reflection and within every workshop I deliver is the handing over of responsibility. This is on all of us. Every single one of us can be part of the problem, but we also have the choice to be part of the solution and this choice is what it is all about. We can change things if we choose to, we can unite if we choose to and we can stop racism if we choose to, but we all must choose to. And so the journey continues. Who knows what the future holds for our country, for Show Racism the Red Card and for me, but what a month of growth, development, tears, frustration and absolute enlightenment it has been and I am certainly feeling stronger and more empowered to continue the fight against racism. I am determined to unlock that feeling in the young people I work with to allow the message of peace to spread faster and brighter than the message of hate. It may at times seem bleak but when has anything worth doing been easy? I for one am up for the challenge...but that’s a story for my second month as an Education Worker for Show Racism the Red Card.